Airship Ventures: The obstacle course.. 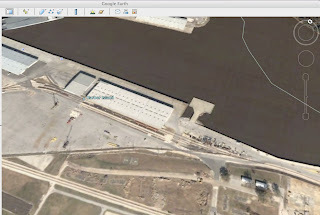 I thought you might enjoy this grab from Google Earth showing the roll on roll off (ro-ro) ramp at Harbor Island, Port of Beaumont. You can see that the Zeppelin had to be steered down a narrow ramp, and across railway tracks. We also had to take down some light poles and move a few barriers. The mooring site is the dirt area to the bottom middle of the image.